For the civilian airport established in 1946, see Jacksons International Airport. 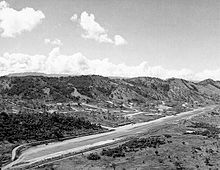 The Port Moresby Airfield Complex was a World War II military airfield complex, built near Port Moresby, Papua and New Guinea. It was used during the Battle of New Guinea as a base of Allied air operations primarily in 1942 and early 1943. It later became a support base as the battle moved to the north and western part of New Guinea. It was closed and the facility turned over to civil authorities after the end of the war in September 1945. This complex of airfields is historically significant as it was from these airfields, the Royal Australian Air Force and the United States Army Air Forces supported Allied ground forces in the Battle of New Guinea. It represented the changing fortune of war in the Pacific and the end of the Japanese expansion in the Southwestern Pacific during World War II. 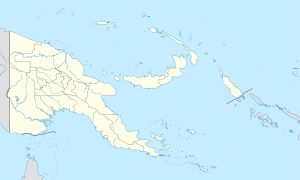 The pre-World War II Port Moresby Airport became one of the primary airfields (Jackson Airfield) used by the Allied forces during the New Guinea campaign (1942–1945), and was part of a multiple-airfield complex in the Port Moresby area. The airfield was built by the Australians in 1933, and during the 1930s it was Port Moresby's first airport. Taken over by the RAAF in January 1942, it was expanded for use by military fighters, light bombers and transports. 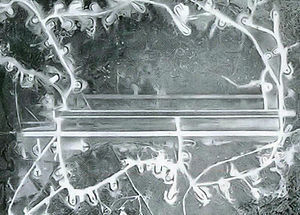 Its runway was a gravel bed overlaid with Pierced Steel Planking 5,000×100 ft. It includes dispersal pads, taxiways and several buildings. By 1944, the airfield was relegated to a support field and was returned to civil use after the war. Today, Kila Kila Airfield is now part of Port Moresby suburban area. It contains the Kila Police Barracks and a technical school. Its wartime past is mostly obliterated by modern development. Named in honor of Squadron Leader John Francis Jackson, D.F.C. 75 Squadron Royal Australian Air Force, aged 34. Killed in action while flying P-40E A29-8 on 28 April 1942. Jackson airfield was one of the primary airfields at Port Moresby at the start of the Japanese invasion of the island, and one of their principal targets. It based the first fighters that flew in defense of Port Moresby, RAAF 75 Squadron from March–May 1942. It was originally a pre-war airstrip with two parallel runways. American B-17 Flying Fortresses used the airfield en route to Clark Field on 9 September 1941. During the war, it was further expanded and improved by the Australians and Americans. When American forces arrived in April 1942, the airfield was further developed. Eventually there were three parallel runways, running roughly north-west to south-east. 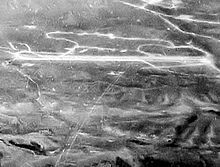 In the middle was the original runway, a fighter strip 3,000×100 ft surfaced with Pierced Steel Planking (PSP). 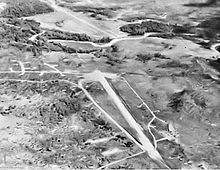 To the north-east side was a bomber strip 3,000' x 150' surfaced with PSP later expanded to 3,750 ft. On the south-west side was a crash strip 7,500×100 ft. Revetment were constructed to protect parked aircraft and defenses. A network of taxiways between Jackson and Wards Airfields made it possible to taxi between the two airfields. Today, the airfield is Papua New Guinea's international airport, and the air hub for all Air Niugini flights in and out of the nation. Also, a number of smaller regional airlines and helicopter and aviation services. At the western end of the airport are several large revetments for B-17 and B-24 bombers, still in excellent condition. Named in honor of Australian Lt. Col. K. H. Ward, who was involved with its construction and was killed on August 27, 1942, during the fighting at Isurava on the Kokoda Trail. Constructed primarily by Australian engineers in 1942, with American engineers grading and surfacing the runway. Consisted of two parallel 6,000' x 100' runways, with an extensive taxiway and revetment area, taxiway connected to Jackson Airfield (7 Mile Drome). During 1943, Wards was the busiest airfield in the entire Southern Hemisphere. It was used by transport and heavy bomber and fighter aircraft. The 27th Air Depot, Air Force Technical Service Command, was located to the southeast of the airfield. The group was responsible for assembling crated aircraft delivered by ship docked in Fairfax Harbor from the United States. Brand new aircraft were delivered to Port Moresby assembled and then flown to other bases. Ships continued to dock at Port Moresby until mid-1945 when transports switched to Manila Bay. Today, Wards Airfield is now part of Port Moresby suburban area. The main runway of the airfield appears to be used as Kumuni Avenue, in the Waigani area of Port Moresby, where most of the government buildings and embassies are located. The revetments and most of the wartime facilities, however, are now part of history. Located on a hill behind Wards Drome. A large 5th Air Force insignia and USAAF star, drawn into the concrete. Concrete steps, a garden and path that went up the ridge towards the HQ. In the 1980s traces of the paint still remained. Today, both the 5th AF logo and USSAF are partially broken, and the area is overgrown, but it still offers commanding views and an impressive remnant of the American era at Wards Airfield. Officially named Berry Airfield in honor of P-39D 41-7165 pilot Major Jack W. Berry on November 10, 1942. The airfield was constructed in early 1942, being completed on 15 May. The airfield had an 8-inch base of crushed rock and pit gravel for a single earth runway approximately 4,500' by 150'. It also had 40 dispersal bays, and 4 alert areas that would accommodate 15 fighter aircraft. Today the former main runway has been converted to a road which goes to Port Moresby. The Bomana Police Training College is located at the site of the former strip, and the Bomana War Cemetery is at the far end of the strip. All in all, the former airfield site is obliterated by the march of time and development in the area. Named in honor of Charles Schwimmer on 10 November 1942, lost in P-39D 41-6956 intercepting Japanese aircraft over Port Moresby. Built in 1942 and surfaced with PSP. 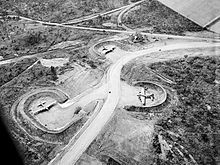 No revetments were built at the airfield, but taxiway and parking areas dispersed to the north of the runway in a semi-circle. Living quarters were pyramid tents a half mile from the strip in scrub trees. The airfield was abandoned after the war, and today no evidence remains that this was a military airfield, being completely obliterated by the passage of time and human redevelopment of the site. Opened in early 1942, was as a frontline airfield for fighters and medium bombers during all of 1943. Consisted of a single main runway, running roughly NW-SE was constructed by the 808th Airborne Engineers, and completed in August 1942. The runway was separate from the dispersal and camp areas, where revetments were carved into hillsides and taxiways elevated for drainage. Gun pits built of 55 gallon drums for anti-aircraft were built on the surrounding hills, and buildings on concrete slabs, or tents on gravel from the nearby quarry. A single main runway, running roughly NW-SE was constructed by the 808th Airborne Engineers, and completed in August 1942. The runway was separate from the dispersal and camp areas, where revetments were carved into hillsides and taxiways elevated for drainage. Gun pits built of 55 gallon drums for anti-aircraft were built on the surrounding hills, and buildings on concrete slabs, or tents on gravel from the nearby quarry. Abandoned after the war ended, vegetation has returned to the area once cleared off for an airfield. Presumably elements of the facility remain under the vegetation canopy as an outline of the main runway can be discerned. Named in honor of Major Floyd "Buck" W. Rogers (C. O. of 3rd Bombardment Group, 8th BS Bombardment Squadron) who was KIA piloting A-24 41-15797. The airfield was built by the US Army, construction was initiated during the middle of 1942. On May 4, 1942, US Army 43rd Engineering Regiment, Company E moves to this location begin construction. Originally, the single runway was to be surfaced with marston matting, but the matting bound for this airfield was instead retained for use in Port Moresby. 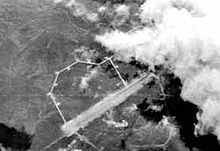 Without matting, this airstrip was not capable of handling heavy bombers. The first usage of the competed runway was during the first week of June, 1942. When built, it was described as a secret airfield. Probably, one of the first landings at the airfield when a damaged P-39 Airacobra piloted by Paul G. Brown on 17 May 1942. Later, the Airacobra was repaired and flew back to base. The airfield was used to base fighters from July 1942 until the end of August 1943. Afterwards, the airfield continued to be used as a crash strip. The airfield was apparently used as a private airport until the 1970s, then abandoned. Today, the outline of the main runway can be seen in aerial imagery; the entire area has returned to a natural vegetation cover, being overgrown with kunai grass. Built by the RAAF c. 1944 as an emergency airfield on Daugo Island. Abandoned since the end of World War II, today the remains of the runway can be seen in aerial images. This page was last modified on 25 January 2016, at 04:25.